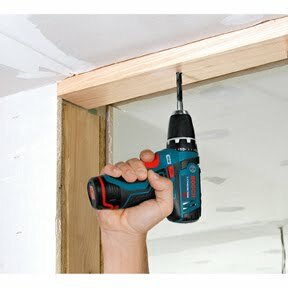 Bosch PS31-2A 12 volt Drill/Driver is an update of the PS30-2A and an up-sized version of the PS21 pocket tool. While the PS21 accepts 1/4 inch hex shanks without a chuck, the PS31 uses a 3/8 inch keyless three jaw chuck which greatly reduces the wobble while accepting a wide array of bits solidly. The PS31 is slightly heavier and longer than the PS21, but at 7” length and height and just over 2 pounds is still a small package. no-load speed, and runs with a speed of twice the normal speed in this class. The clutch and variable speed trigger allow precise control over the speed and power, allowing for greater precision work over a wide range of applications. illuminating your work area, although it seems a little under power and is partially block by the cluck, it still does the job. For a lightweight 12-volt drill/drivers everything feels well built with of high quality, the drill has good power and speed, lightweight, and has a comfortable grip. The Drill/Driver uses a lightweight and compact design that has the shortest height and shortest head length, making this drill/driver small enough to fit into tight areas. Bosch PS31-2A also packs 265 inch-pounds of torque providing up to twice the torque than its competition. For any hobbyist or handyman that does want to deal with the weight of a 18-volt drill this is a excellent choice. It is a bit underpowered for daily production work, but is a good choice for a reliable, lightweight yet powerful drive/driver for your tool box. The Bosch PS31-2A 12 volt Drill/Driver Two-Speed Drill/Driver comes with two batteries, a 30-minute charger and a sturdy soft-side case.